It’s been a little bit since I last blogged and the reason is simple. I’m in the process of packing up my life for the eighth time since I left my mom’s house in preparation for Petey the Troll Apparel’s relocation to the great city of Toronto. Additionally, we’re currently working on our application for Alternative Fashion Week in TO this year and it has proved to be a mammoth project. The setting for the photoshoot for the two outfits we’re planning on submitting is none other than Detroit city, Windsor’s pathetic, unemployed older cousin. So this post is going to be about my research on that fantastic town of ruins and how we plan to use abandoned structures in a dichotomy with couture fashion to represent the overall intended artistic impact of this year’s collection. 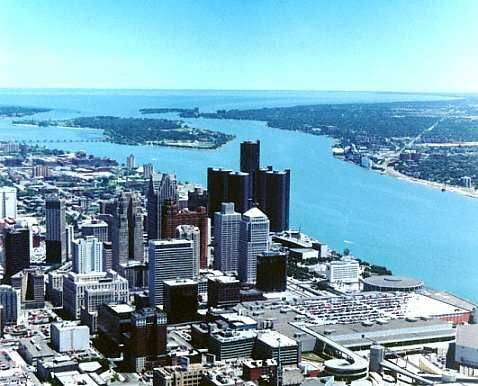 I first really became fascinated with Detroit when I took an architecture class in my third year of University. I was privileged enough to have Dr. Veronica Mogyorody as a professor in this class and have been addicted to modernist architecture ever since. The seed had been planted so when I was introduced to Detroit from an art historical perspective by Dr. Michael Farrell when I was finishing up my degree, I became obsessed. I also spent a lot of time working on Detroit research when I completed a final project for a History Workshop on the 1967 Race Riots. The decline and fall of this once magnificent city captivated me, and I’ve been in love ever since. There's this really unbelievable documentary me and Meaghan watched after a trip to Detroit last week called Requiem for Detroit. We were across the creek earlier that day for fabric shopping, gallery visiting and of course, urban exploration. We were mapping out the locations for our next Couture photoshoot, and paid a visit to the old Michigan Central Station. I cannot express to you how overwhelming it is to be around these abandoned architectural masterpieces in Detroit. Every empty building tells its own sad story about the fall of the great city that was once the 4th biggest in the United States. What attracted us to using these buildings for our photoshoot was the duality of the beauty and devastation that every inch of Detroit eminates. 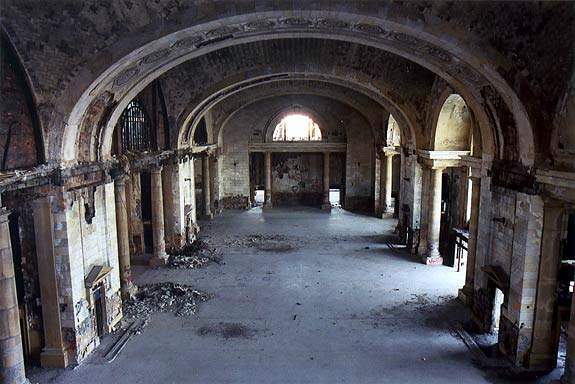 The Michigan Central Station, for example, was at one time one of the most glorious beaux-arts structures north of New York. It was built with the intention of being way over the top in tersm of elegance, luxury and style. It was meant to be the place where people first arrived in Detroit - the golden gate before entering the sparkling city. Did you know that once, to celebrate the 50th anniversary of the automobile, the Detroiters thought it would be quite fitting (and quite humble... I must say) to paint the downtown section of Woodward avenue GOLD. Can you imagine painting Woodward avenue gold today? I thought it would be a fantastic art piece for someone to execute. If I have loads of cash one day (as all artists do, I'm sure,) maybe I'll do it... just for the remarkable sense of irony. As soon as we returned from Michigan central Station that day I started looking up more of the classic abandoned buildings in the downtown core. One was the Book Tower. I've looked at the building from afar many times and never quite knew what to think. It reminded me of something out of Gotham City. It's one of the Italian Renaissance inspired buildings that was added to the city when they were still wealthy. The Book Brothers, in the early 1920s saw that the car industry was booming in this town and it looked like it could only get better from there. 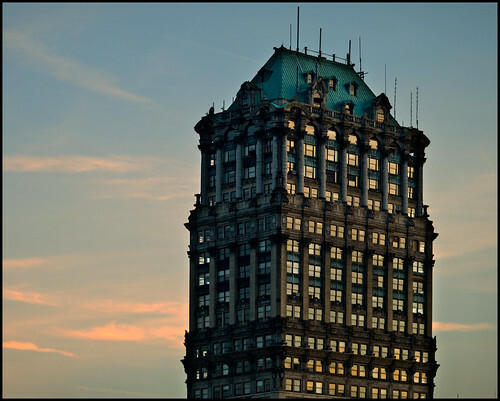 They built buildings along Washington Blvd in Detroit including this one which stood with to the old Book-Cadillac Hotel. O ur collection is about endings and new beginnings. Themes of darkness and death are the base, with ovetones of hope for renaissance and a brighter future. If a city like Detroit, with it's fascinating and tragic story is not perfect as a backdrop for this collection, I really can't think of what would be better. We're going tomorrow to shoot the promo photos, so look for them within a week's time at http://peteythetrollapparel.com! !